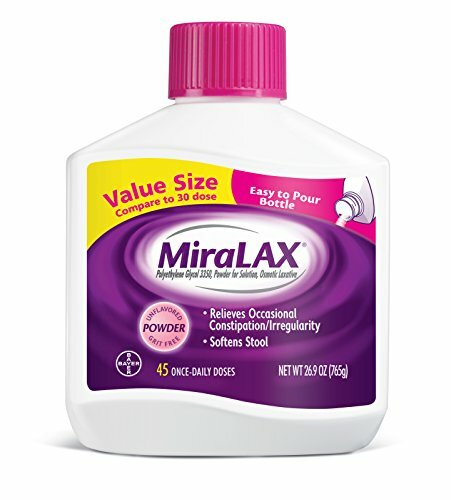 MiraLAX is the #1 Doctor recommended laxative, providing effective and predictable relief for occasional constipation. 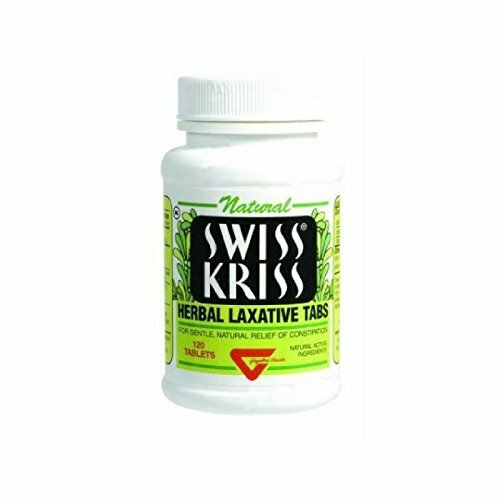 MiraLAX is clinically proven to relieve occasional constipation and soften stool without causing harsh side effects such as sudden urgency, cramping, bloating and gas. MiraLAX powder dissolves completely in water or any hot or cold beverage of your choice with no added taste or grit. Works with the water in your body to hydrate, soften, and ease to unblock your system naturally. Use as directed for occasional constipation. 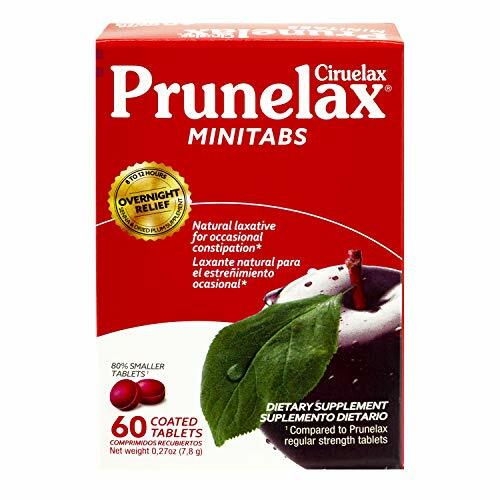 Compare to Prilosec OTC . 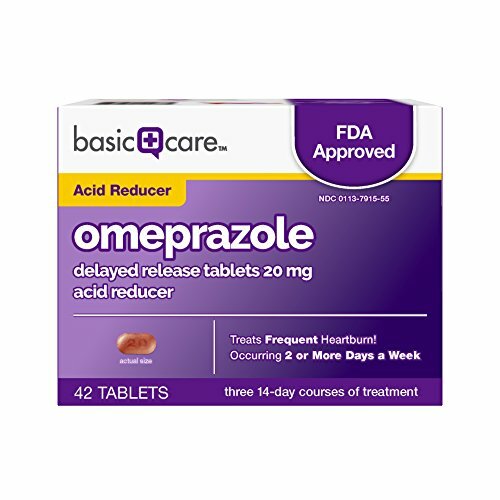 Omeprazole Delayed Release Tablets 20 mg, acid reducer, treats frequent heartburn occurring 2 or more days per week. 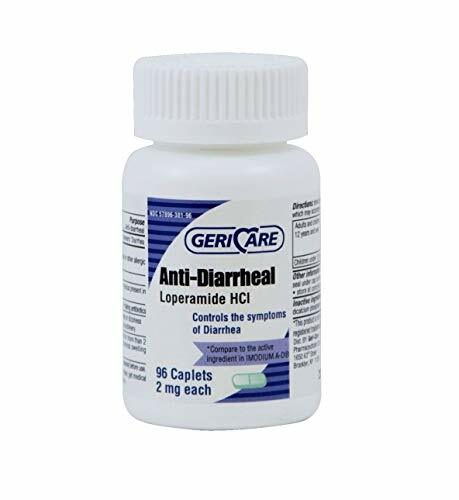 The active ingredient is omeprazole 20 mg, a Proton Pump Inhibitor (PPI) that deactivates pumps in the stomach lining to inhibit acid production at the source. 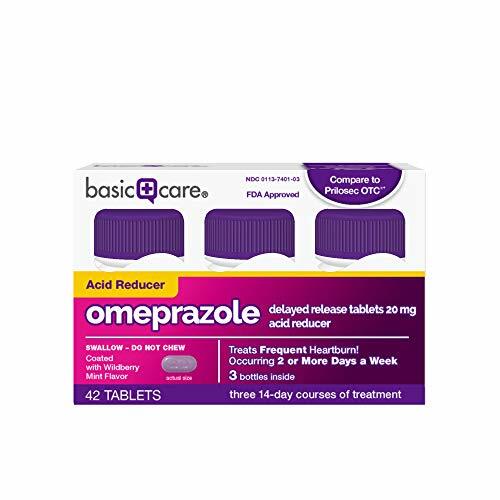 Taken once every 24 hours for 14 days, Omeprazole Delayed Release Tablets 20 mg is not intended for immediate relief of heartburn and may take 1 to 4 days for full effect. Made in Israel. 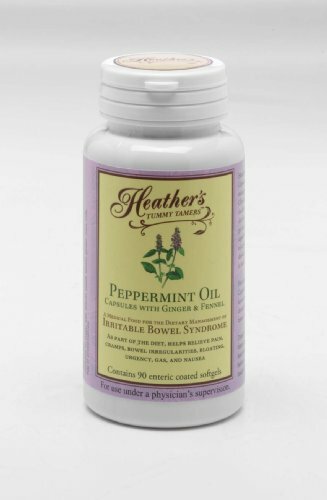 Extremely useful for IBS abdominal pain, diarrhea, bloating, urgency, and gas. Enteric coating lets capsules pass through the stomach intact and dissolve in the intestines. Compare to Maximum Strength Pepcid AC active ingredient. 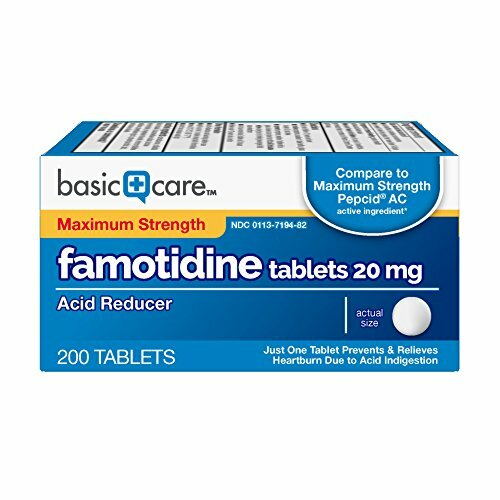 Maximum Strength Famotidine Tablets, 20 mg, is an H2 Blocker. These partially block production of acid in the stomach cells by inhibiting histamine, a substance that stimulates secretion of stomach acid. Over-the-counter and prescription H2 blockers relieve heartburn associated with acid indigestion and sour stomach and prevent meal-induced heartburn. Compares to the active ingredient in Imodium A-D. Coated with Wildberry Mint Flavor. Swallow - do not chew. 1.Adjust the control of the vagal nerve to gastrointestinal tract, inhibit the motility of the gastrointestinal , thus preventing nausea and vomiting. 2.By expanding the capillaries of the skin , to improve the microcirculation of body and increase the amount of oxygen to brain ,thus comes to the effect of refreshing your brain. Relieve the vomiting, nausea, dizziness, anorexia, and other symptoms resulted from sickness of cars, ships, airplanes, trains and other means of transport. 1.Tear the protective layer,adhere the adhesive layer to the navel or the back of your ears. 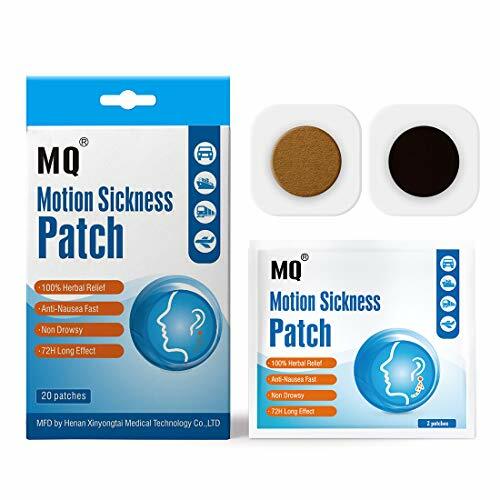 2.One/two patch per time,according to your body condition,Painless to remove. 3.Attach 10 minutes before the travel ,the effect will last about 1-3 days . 1.Not Use on Pregnant,Breast-feeding and Kid under 4. 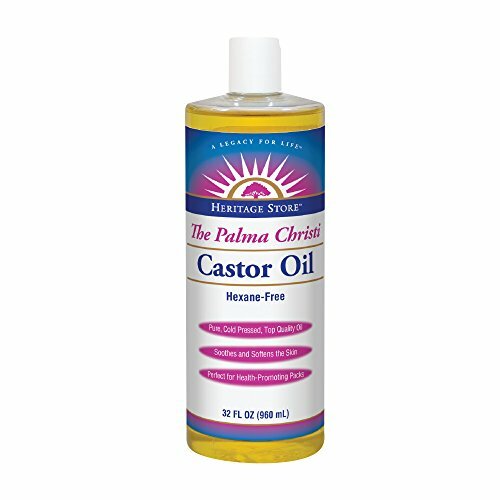 2.Avoid use on allergic and broken skin. 3.Not recommend to use by poorly surgery body. Safe for kids up to 4, NOT used by Pregnant and Surgery body. Small and Light packing for best travel partner. There are other ginger products available, but NOT ALL GINGERS ARE EQUAL... Why don't ginger pills and capsules help out my nausea right away? What about ginger candy or crystalized ginger, do they work? Crystalized ginger and ginger candies are designed to be candy & do not have enough of the special soothing compounds in ginger to be effective. Ginger tummydrops contain a patent-pending specialized blend of purified gingers that are enriched in gingerol to help soothe nausea and digestive upsets. One taste and you'll know that they are unique & special! Is ginger safe during pregnancy? Ginger is frequently recommended by OB doctors to assist morning sickness. Ginger tummydrops are made from a special blend of GMO-free gingers to ensure you are getting the best quality product available. As with all supplements, be sure to discuss with your physician before starting ginger. I can't have gluten, are tummy drops gluten-free? Unlike some ginger products, all ginger tummy drops are gluten-free. I can only take kosher products, are tummy drops kosher? 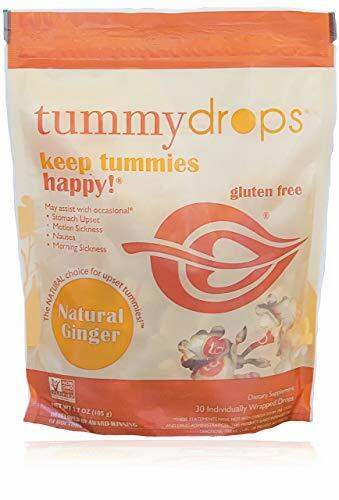 Ginger tummy drops are kosher certified. Ingredients and Nutritional Information + All-natural! Brown rice syrup, dried cane syrup, natural ginger powder (proprietary blend), and natural flavor. We truly want ALL of our customers to be fully satisfied! IF YOU ARE NOT 100% SATISFIED WITH YOUR PURCHASE, CONTACT US FOR A FULL REFUND. THIS IS OUR MOST SPICY AND POTENT TUMMYDROP. IF YOU ARE SENSITIVE TO SPICE, CONSIDER THE GINGER PEAR OR GINGER PEACH TUMMYDROPS. IF YOU FIND THIS TUMMYDROP TOO INTENSE, PLEASE CONTACT US FOR A FULL REFUND-WE TRULY WANT ALL OF OUR CUSTOMERS TO BE COMPLETELY SATISFIED! Gluten free. Great tasting. Nothing artificial. Non-GMO project verified! Free of sugar alcohols. Specially designed by GI doctors for their patients, now available for everyone. Great for travel and motion sickness! 30 individually wrapped drops per bag. "If there s one thing you know a lot about as a mom, it s your baby s poop. And when you notice they re not going like they should, Constipation Ease can help. We make it with real prune juice and no chemical laxatives to re-boot your baby s system naturally and gently. 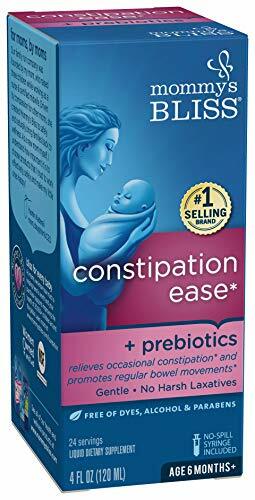 BABY CONSTIPATION RELIEF: Mommy's Bliss Constipation Ease has no harsh laxatives, only gentle, effective herbal ingredients, like prune juice and organic dandelion, to help get things moving, naturally. Prebiotics help support baby's digestive health. BABY CONSTIPATION RELIEF: Like probiotics in Mommy's Bliss Probiotic Drops, the prebiotics in Mommy's Bliss Constipation Ease help promote the growth of healthy bacteria in the gut, & can be helpful during the transition to solid foods or potty training. REMEDIES FOR BABY: Our remedies help ease baby's discomfort & bring back smiles*. From gripe water to help calm colic or tummy troubles, to organic baby cough syrup, baby probiotic drops, or baby vitamins, we help you find your parenting bliss*. An all-natural way to assist with symptoms common in morning sickness & IBS! Gluten-free, great tasting, & nothing artificial! Great for travel. Free of sugar alcohols. 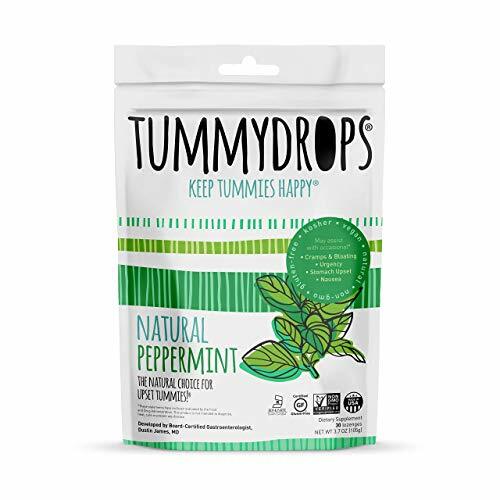 Tummy Drops Keep Tummies Happy! Made in the USA Non-GMO Project Verified. Natural Relief from Morning Sickness! With common ailments like nausea, cramps and constipation, it s no secret that pregnancy can be an uncomfortable time for expectant mothers. But before you reach for potentially harmful medications, we have a better solution! Pink Stork introduces our Ginger Peach Pregnancy Tea, great for achieving the relief you need! Because it s loaded with the stomach-settling power of organic ginger, it s a great defense for women who suffer from morning sickness, nausea or vomiting. Ginger's effectiveness has even been proven in over 100 double blind clinical trials! The active compound found in ginger, 6-gingerol, may even help reduce symptoms of hyperemesis gravidarum. Don t like the taste of ginger? The peach flavoring balances it perfectly! But the benefits don t stop there! By relaxing the intestinal tract, our special blend can also help ease problems like cramps, constipation and diarrhea. With a natural peach flavor, this tasty tea is soothing when warm and refreshing when cold! To bring even more value, each order includes our Program Overview, which offers dietary recommendations to optimize prenatal health. With delicious herbs and black tea leaves sourced from Sri Lanka, this premium blend is safe for any soon-to-be mom! Our biodegradable pyramid sachets also provide more flavor than traditional tea bags. Directions for Use: - Boil 8 oz of water - Pour over Pink Stock tea - Allow to cool and enjoy Why Choose Our Pregnancy Tea? - Minimizes morning sickness - Promotes relief from cramps and constipation - Includes our Program Overview - Delicious hot or cold - Natural and organic ingredients Try Today Risk Free with Our Satisfaction Guarantee! *Supply is limited. Please order today to ensure availability. Order Your Tea Now and Get the Relief You Need! NATURAL MORNING SICKNESS REMEDY: Morning sickness is a less-than-ideal way to start your day. But thanks to the proven effects of ingredients like ginger and Ceylon black tea, our hydrating drink settles your stomach, easing nausea and the symptoms of severe morning sickness! MULTI-SYMPTOM RELIEF: Our ginger tea is more than just a natural remedy for morning sickness! With regular consumption, our potent tea leaves and powerhouse herbs promote relief from cramps, constipation, diarrhea and motion sickness by relaxing the intestinal tract. 100% ORGANIC, GLUTEN-FREE, NON-GMO, VEGAN, & KOSHER: Just like Pink Stork's other products, Morning Sickness Tea contains only the highest quality Non-GMO and organic herbs available. Enjoy large servings of digestion-enhancing herbs in a blend that's delicious hot or cold. AMPLIFIED MEDICINAL PROPERTIES: Thanks to organic ingredients and our biodegradable pyramid design, you get much bigger portions of yummy tea and organic ginger than traditional tea bags. The health benefits are amplified for faster, more effective results. BACKED BY OUR HAPPINESS GUARANTEE: Pink Stork is dedicated to delivering happy and healthy families. If you are unsatisfied with our products in any way, we ask that you please let us know, so we have the chance to make it right. We won't stop until you're happy! VITAMIN B6 + GINGER: The natural medicinal properties of Vitamin B6 and Ginger can't be beat when it comes to natural nausea relief. Vitamin B6 is frequently recommended during pregnancy to help with nausea while ginger's anti-inflammatory properties have been used to help with morning sickness for millennia. 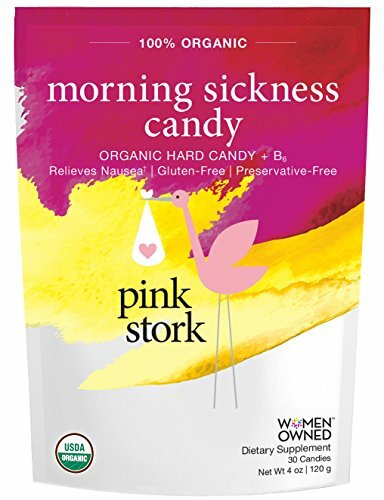 RELIEVE NAUSEA: Pink Stork Morning Sickness Sweets are proven to be effective in managing nausea related to morning sickness - but it isn't exclusively for pregnant women. 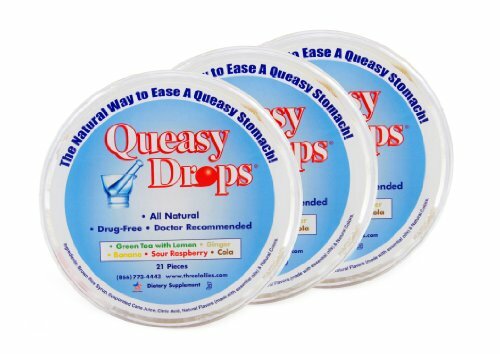 These individually wrapped drops may be beneficial for anyone experiencing nausea due to motion sickness, headaches and migraines, and much more. NATURAL RASPBERRY FLAVOR: The natural raspberry flavor of Pink Stork Morning Sickness Sweets perfectly balances the organic ginger. Pregnant women are inundated with ginger products, but our flavors are impeccably paired to provide delicious relief from morning sickness. These sweets are delightfully sweet, tasty, and beneficial! USDA ORGANIC, GLUTEN FREE, NON-GMO, PRESERVATIVE FREE: Offering the best supplements means never skimping on quality! Pink Stork only offers the very best products to assist women throughout pregnancy and beyond. 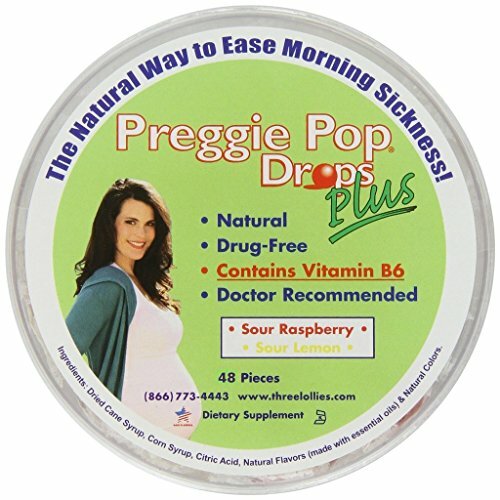 Say goodbye to morning sickness and a queasy tummy with Three Lollies Preggie Pop Plus w/ Vitamin B6, Morning Sickness Relief! Each drop contains powerful essential oils and plant botanicals proven to relieve nausea and queasy stomach due to pregnancy, labor medications, vitamins and supplements, even post-anesthesia and surgery. Three Lollies products are all-natural, drug-free, chemical-free and organic so its 100% safe for mom and baby. Finally an alternative to traditional old saltine crackers or thick cola syrups. 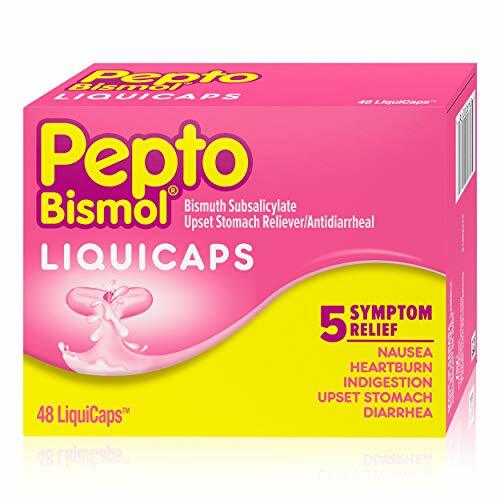 Great tasting, fast-acting and highly effective at combating your nausea and upset stomach with absolutely no side effects. Made with powerful essential oils of fruit and plant botanicals that are proven to help relieve nausea. Contains no artificial flavors or colors. Alleviates dry mouth during labor and provides a quick energy boost. Also makes a safe, more effective alternative to plain ice chips or gum. Each piece is individually wrapped for convenience so they are perfect to take along in your purse, labor bag, pocket, diaper bag, luggage, computer bag, briefcase or to always keep handy in the glove compartment of your car. 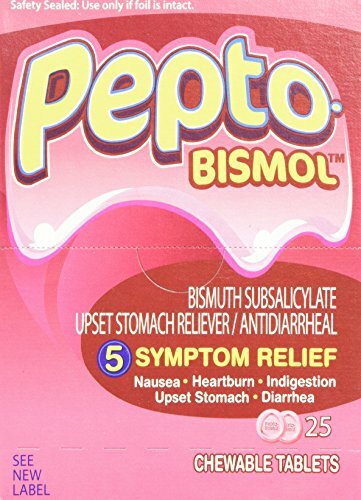 Goes to work immediately on your upset stomach. Recommended by doctors and healthcare professionals. A box of our most effective flavors contain Sour Raspberry & Sour Lemon, each individually-wrapped lollipops within a container. 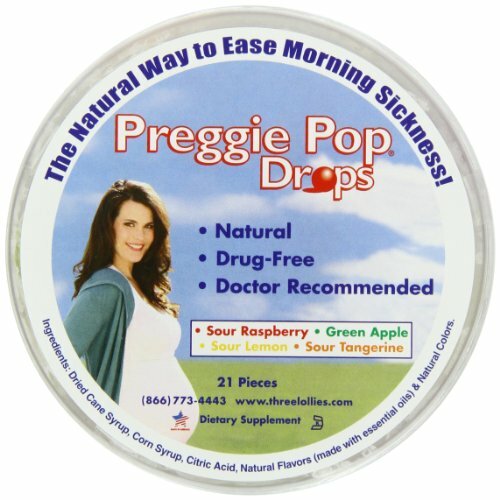 See all our Three Lollies products: Preggie Pops for strong morning sickness relief, Preggie Pop Drops Plus with 10mg vitamin B6 for extra-strong morning sickness relief and finally Queasy Pops for all-purpose nausea relief due to sickness, traveling, car/air travel, pregnancy, morning sickness, medications - even chemotherapy and post-anesthesia. Enjoy relief today! Perfect remedy for morning sickness and a queasy tummy. Natural essential oils and plant botanicals used to relieve nausea. All natural and drug free and 100% safe for mom and baby, and Healthcare Professional recommended. Each piece is individually wrapped, Gluten-Free and Kosher! 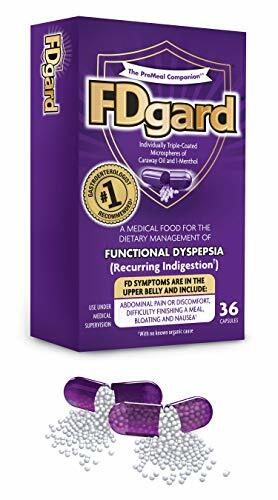 Brand: FDgard | Manufacturer: IM HealthScience LLC. Size:24 x 12 x 6cm / 9.45" x 4.72" x 2.36"
Lens-Free Design And High Quality PP Material No lens design, even myopia people can be used. Made of high quality PP material with superior toughness and antioxidant capacity. World Premiere, New Invention For Treating Motion Sickness! Are you upset about traffic vertigo? Are you depressed because you are seasick, seasick and can't go to see the scenery of the island or make a long trip? With our anti-motion sickness glasses, you will no longer worry about these problems! How To Use When you start the motion sickness, wear this pair of glasses for 10 to 12 minutes, and stare at a stationary object such as a smartphone or a book ,then the motion sickness will disappear. Quality After-Sales Service We have an excellent customer service team. If you have any questions about our products, please feel free to contact us and we will give you a satisfactory answer as soon as possible. Why You Can Say Goodbye To Motion Sickness When you are sitting in a car that is turning, braking, accelerating, bumping, while your eyes are staring at the screen in your hand, your cochlea is secretly passing the signal to the brain, precisely because of the sum Differences in the perceived signal will affect your sensory cognitive balance, resulting in dizziness, nausea and other motion sickness. 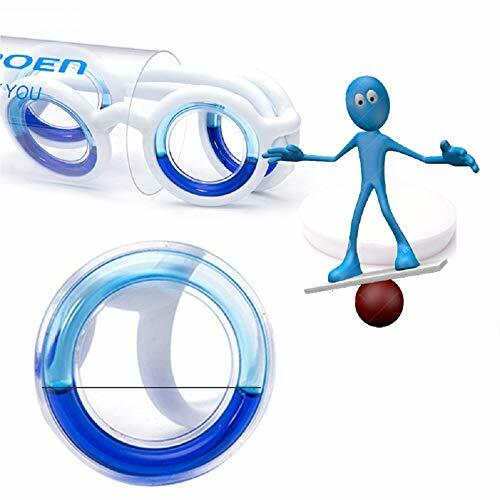 The blue liquid in the ring will flow with your bumps in the car, in front of your v.
Graxcell pharmaceutical Laxative suppositories Bisacodyl USP 10 mg contains 100 suppositories. 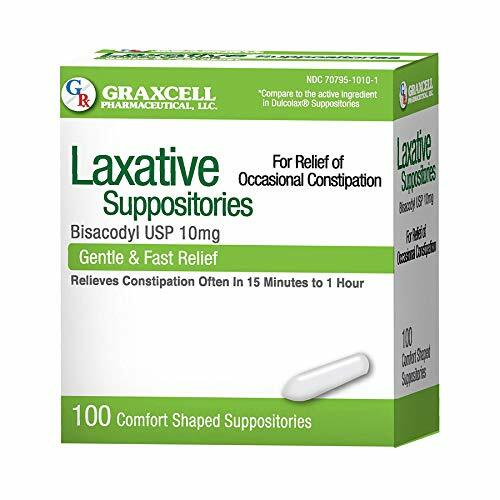 Graxcell Laxative suppositories relieves occasional constipation. This product generally produces bowel movement in 15 minutes to 1 hour. 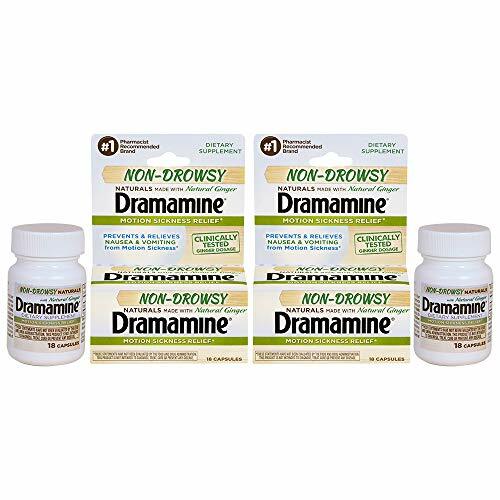 Dramamine Relieves & Prevents Nausea & Vomiting. 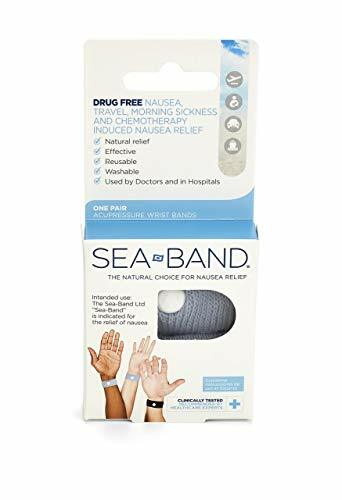 A multi-purpose formula, developed to address nausea from other causes including car rides, commuting, TV, movies, gaming and even morning sickness. And unlike some other solutions, it contains a full clinically tested ginger dosage demonstrated to relieve symptoms. This dietary supplement is safe for kids. 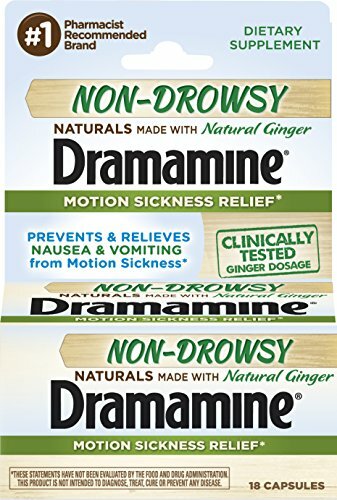 Brand: Dramamine | Manufacturer: Medtech Product Inc.
Motioneaze liquid drops contain high-quality, all-natural botanical oils. 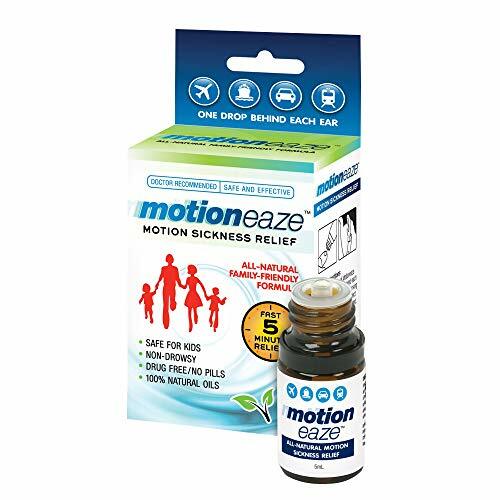 Motioneaze may help to provide fast relief for dizziness, feelings of spinning and nausea. Motioneaze works most effectively when a drop is applied behind each earlobe before or after dizziness begins. This non-drowsy formula for safe* children and adults. Motion sickness can be caused from repetitive movements and is often associated with air sickness, sea sickness and car sickness.